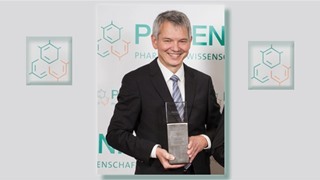 Prof. Hanns Ulrich Zeilhofer and his group have been honored with the Phoenix-Pharmacy Research Award. The group received the award in recognition of their research on the identification of a new target for the treatment of chronic pain, published in Nature Communications. Chronic pain is a severe medical condition that affects millions of people worldwide. When applied locally, benzodiazepines (BDZs) are effective for the treatment of chronic pain. However, these substances have many adverse effects when applied systemically. BDZs bind to GABAA-receptors through 4 different subtypes. In the awarded paper, Zeilhofer and colleagues describe results obtained with 4 transgenic mouse lines, each carrying only one active GABAA-receptor subtype. The results show that targeting the receptor subtype α2GABAA leads to effective alleviation of pain with reduced side effects. These results should help in the development of more targeted, subtype-selective BDZs for indications such as chronic pain. The Phoenix Pharmacy Research Award ranks among the top scientific awards in German-speaking region. The Phoenix Group awards the prize of 10’000 Euro each year for outstanding pharmaceutical research projects in Germany, Austria and Switzerland with the aim to help strengthen the pharmaceutical value chain.